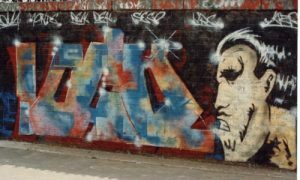 Welsh graffiti writers have been getting up since the early 80’s, when films like Wildstyle and Style Wars were finding their way into the UK’s video players. Henry Chalfant’s Subway Art and Spraycan Art, as well as original photographs of New York trains and Homemade zines provided inspiration for young Welsh artists. Trefforest Industrial Estate, Webbs timber yard in Rhydyfelin, the old Nelson’s garage in Swansea and walls in St. Mellons, Cardiff all became playgrounds for youngsters with spray cans, including an 11-year-old Skroe. Skroe noticed Coma written on the wall in St. Mellons, and eventually realised it was his uncle! Cardiff busses, trains, the Valley line and mainline tracks were also hit hard, with names like Jesus, RonOne, Eaze and Cam attracting the attention of budding writers. Over is the only writer still active from the early 80’s in Swansea, and he remembers seeing FINA (Funky Individual No1 Artist) and Coma up on the Cardiff lines. Resh started painting in Swansea and is still active now on the streets of Cardiff. Unfortunately there are not many photos left from the early days of Welsh graffiti as ‘Operation Anderson’ in 1989 meant that police confiscated them. Writers eventually started walking the tracks again and there was a resurgence of graffiti in the late nineties with crews such as IAU, B52 and HSG forming. Skroe, Hoxe and Rmer became Cruel Vapours a few years later. Cardiff’s first legal Halls of Fame were springing up in Hailey Park, Richmond Road and Elm Street, and RonOne started selling paint as Oner Signs (est. 1996), which has become a central meeting point for writers. Inkspot was the first shop in Cardiff to sell Buntlak, when RonOne was working in a sign company on Clifton Street nearby. Sadsak remembers seeing RonOne’s pieces in Webbs timber yard and bought his first paint from Oner Signs. Ceres got into graffiti after noticing various Rmer pieces around the city. He painted his first train in 1999 after stumbling across Canton train yard by accident while track walking with Best. He vowed to return to paint it, which started a love affair with painting trains all over the world, that hasn’t faltered even after various arrests and jail terms. Best went on to set up Peaceful Progress, and the Boiler House, Cardiff, which has held exhibitions and events since 2010, supporting writers to sell their work on canvas, making that crossover into graffiti as ‘art’. Compass Point festival and the Oner rooftop jams provided opportunities for writers to come together. In 2007, a young writer, Roxe, sadly passed away. His family used £400 from a collection taken at the church service to set up the infamous Roxe jam, which took place in Sevenoaks park. The jam was self-funded, with up and coming writers News, Karm, Rens and others working together to make it happen. In 2008 Arts Council funding, along with sponsored bike rides etc. meant the jam could also include dancers and music. Another writer who passed away young was Gorf – his piece from the 2009 Roxe Jam still remains, with people painting around it rather than over it. More recently, the Millenium Walkway has provided a central space for events, and some of my previous blogs document the process of saving it from being sold for advertising. The Hold Up have provided a soundtrack for many jams over recent years, giving a platform to up and coming MC’s and DJ’s. Writers don’t all have a strictly Hiphop musical taste however – many early writers were hippies, into rock and house music. By the 80’s though, the link was made with bboying and rap, and graff became more known for being under the Hiphop umbrella. This is a work in progress. If you have more information to add, or suggestions of people to contact, please drop me a line. Thank you for reading! Thank you to all those who have contributed so far: Peaceful Progress, Oner Signs, Sadsak, Resh, Ceres, Skroe, Over, Enta and Sion Kisby.